Last week we heard about California's budget crisis in Gov. Jerry Brown's 20-minute State of the State address. While Gov Brown stuck to state budget details in his address, the regulatory crisis movement is gaining momentum as a realistic solution to revenue shortfalls here and across the country. In late Jnauary, there were some particular light-shedding developments in a hearing at the Little Hoover Commission on California's regulatory process. 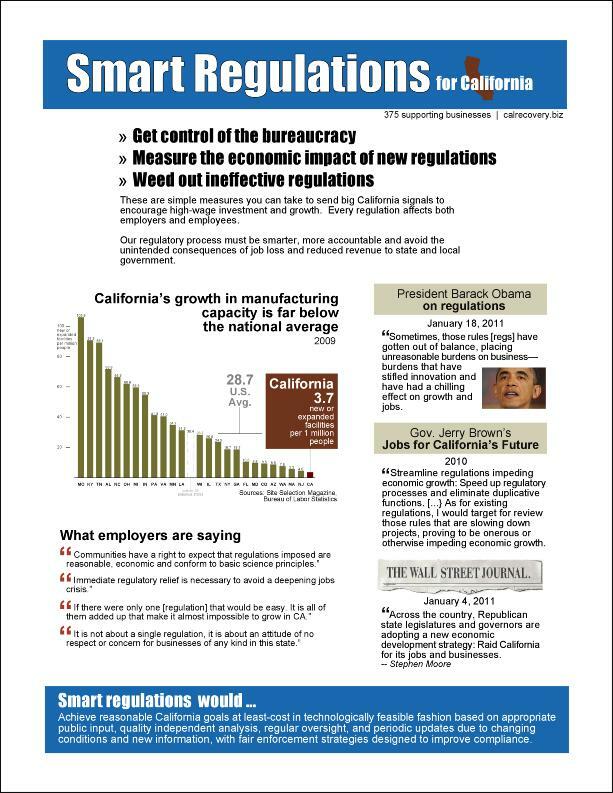 California has thousands of regulations that impact the way we operate. Given the state of our economy, many people ask the very valid but overwhelming question, "If there were just a few regulations that we could fix or eliminate to help us compete, what would they be?" That was not the question before the hearing last week. This is too daunting a question, at least for the moment. For a state with 37 million people, tens of thousands of businesses, a $1.7 trillion economy, and -- after years of the rule-making status quo -- thousands of regulations that might or might not be cost effective, a hundred people will give you 100 different answers to that simple question. We learned in the hearing what most of us already felt. California is flying blind on the cost effectiveness of new regulations, with only a politically charged environment as its guide. It's not that people aren't doing their job. Legislators are passing bills that they think are valuable. Agency rule-makers are implementing those laws or goals with regulations based on input. The folks tasked with economic impact analysis, Office of Administrative Law (OAL), are providing opinions on those impacts. The problem lies in the anemic levels of economic analysis and an expedient culture to rule-making. Depending on the step in the process, you either get a foregone conclusion or a cursory analysis because of limited resources. But here's the big kicker that came out of last week's hearing: When the hard working folks at the OAL suggest to a rulemaking agency that a regulation might have some negative economic impact on an industry or a consumer, they have almost no recourse to pull that regulation back. It was stated by OAL that not one regulation has been pulled back once their disagreement with an agency reached a judge who had authority to do so. Resources are too limited for sufficient cost-benefit analysis on regulations. When they do see a potential problem, the process only provides for an expedient way to approve a regulation anyway. There are too many "underground regulations" that circumvent the analysis-requiring Administrative Procedures Act. If you watch the hearing, you'll wonder, "What has everyone been so afraid of?" Why has one of the most effective tools -- independent economic analysis -- been shunned by California? Don't let one industry, one person, or one consumer tell us what regulation should be fixed or repealed. We can all make our case for certain regulatory fixes or relief (and we will), but independent economic analysis must be the government's guide or, at the very least, a well-regarded tool in their rulemaking for smarter regulations. Last week's hearing (the second conducted by the commission) went a long way in getting us there. UC Davis economist, James Sanchirico (comments), and Harvard economist, Robert Stavins (comments) both provided compelling points that also underscored the need for sufficiently funded, independent and rigorous regulatory assessment.